Nowadays, the most common ways for sharing files between two mobile devices are Wi-Fi and Bluetooth. The bad thing about them is that they need a setting up before they are used, but using a new technology provided by Near Field Communication (NFC), you will simply need to tap the devices against them. Using NFC and Android Beam, will allow you to share data to similar devices, such as contact information, web pages URLs, map directions, Google Play Store pages and others. It is well known that Bluetooth transfers need a long time to complete for large files, such as videos and tracks. 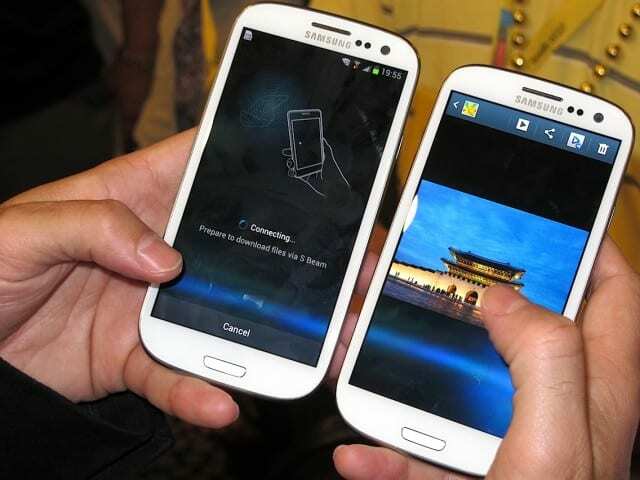 The NFC’s hassle-free system was adopted by Samsung and it will be available on Samsung Android devices like Galaxy Note 2 and Galaxy S3. The NFC is used with Wi-Fi Direct for transfers that can end in seconds. So, if you want to use it, you will need to follow some easy steps. First, you will activate the S Beam on your device from your Settings. The S Beam will be found in More Settings. Also, you will need to enable the NFC because the S Beam is not working without it. For a successful transfer, you will need to pay attention to some aspects. – S Beam feature and NFC should be active on both devices. – Both devices shouldn’t be locked or asleep. The receiver device must be on home screen for a better experience. – The two devices will vibrate and make a sound after they have detected each other. – Let the transfer begin and then you can separate your devices. – Files can be transferred if they are locally saved. You can’t transfer files saved in your accounts. – Make the connection and place the devices against each other. – Tap the message “Tap to beam” found on the sender’s screen. – Separate the devices to begin beaming. To beam images, just follow the standard way for S Beaming content. Open a photo or image from the Gallery and beam away. The receiver device’s Gallery app will show the image after transfer is completed. Images and tracks can be beamed using standard instructions. For videos, you will need to play it and beam away. Contact are beamed the same way as images. Also, you can send Android apps using S Beam. You can’t send the files properly, but you can send the app’s Google play Store URL. You will simply launch the application and beam it away. Google Play Store will be opened on the receiver’s screen which should have an internet connection activated. Web pages are beamed also very easy. The sender will beam the page and the receiver will get the URL opened on its native browser app. The YouTube pages are beamed the same way. Also, you can beam a large variety of content from your mobile if the devices are compatible. This feature offered by Samsung, is a faster way to transfer files than Bluetooth and you should try it for a better experience.